Effect Raises Attack and Defense. Power Lift is a Special Move that can be used by Mario in Paper Mario: The Thousand-Year Door. It raises the Attack and Defense of Mario and his current partner for three turns and requires 3 SP to use. The success of the Action Command determines the number of points each stat is raised by. To use the move, Mario must have the Gold Star, which is obtained at the end of Chapter 3. The Action Command involves a 9-square grid in which red Attack arrows, blue Defense arrows, and Poison Mushrooms appear periodically. 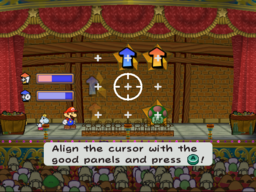 The player has a limited amount of time (which is not shown) to move a cursor up, down, left and right with the , and press to select as many arrows as possible. Each arrow appears for only a few seconds; when selected, the arrow fills up the gauge by 1/5 of its total amount. Every time a gauge fills completely, one point is added to the respective stat (Attack or Defense). If the player selects a Poison Mushroom square, the cursor moves at half speed for a short time which makes it harder to select arrows. This page was last edited on April 18, 2018, at 12:50.